With landscapes like something from a movie, a holiday to Iceland will be one of your most memorable yet. The incredible landscapes draw increasing numbers of visitors each year and are sites that must be seen. For the thrill-seeking traveller, Iceland is packed with opportunities for outdoor adventures and is the place to go for nature-loving explorers. You will be awestruck by the extraordinary attractions this charming island has to offer. Explore Europe's largest glacier where you get to witness 2500 years of ice sculpted by nature. Covering 8% of Iceland's surface Vatnajökull is one of the most in demand and requested winter tourist attractions. Said to be the world's longest sight line it is claimed that you can view the glacier from Slættaratindur mountain, 500km away. Iceland's highest mountain Hvannadalshnjúkur is located within Vatnajökull, dominating the southern part of the glacier. Adventurous travellers are known to visit this glacier to summit the mountain. Even though it is 2,110 meters high hiking to the summit is not complicated. It is definitely physically challenging though. If that is not enough, you can visit Ice Caves located within Vatnajökull. Ice caves are a rare phenomenon that are naturally formed, making them more charming and unique. 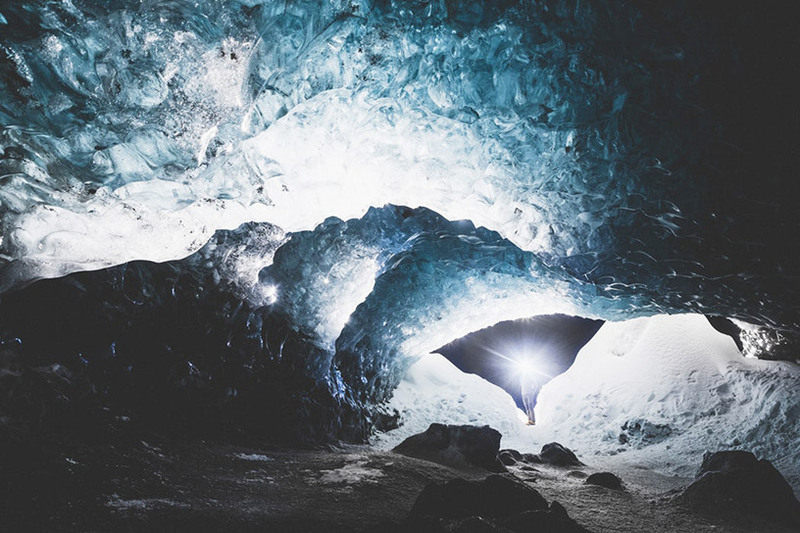 Vatnajökull is one of the most highly recognised Ice Cave locations, from the jewel-like interior. Mesmerising any traveller who walks through the inside of the cave. Be warned the Ice Cave season is from November – March. Don't let this short window deter you from having a once in a lifetime experience. Inside the Ice Cave of Vatnajökull Glacier. Image courtesy of Unsplash user Norbert von Niman. One favourite tourist attraction is Langjokull Glacier. This stunning location is rimmed by Volcanos, as well as containing two gigantic ice-filled craters. This once in a lifetime experience walking inside a glacier will be an unforgettable holiday. Walk into the depths of the magnificent natural ice cave. Take in the exquisite ice formations and learn about a whole new perspective on glaciers. Of course, it is the perfect moment to snap many memorable photos. One of the most highly recommended activities to do at Langjokull is snowmobiling across the glacier. There is nothing quite like getting your adrenaline pumping and enjoy the beauty of nature. You get to experience the stunning views of Iceland's magnificent sights. Snowmobiling at this attraction has something suited for everyone. One of the most unmissable experiences, Langjokull is a destination that will not disappoint. Hot tip: If you want to stay warm avoid wearing jeans when visiting Ice Caves, as once they are wet moisture they take a long time to dry. 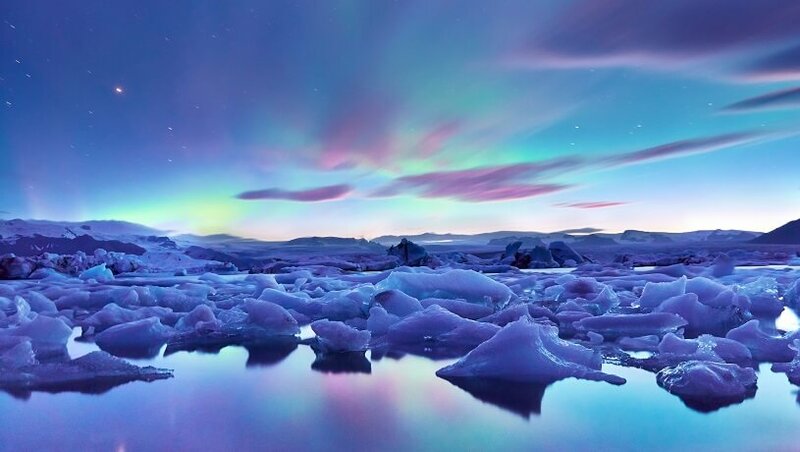 Iceland is considered one of the best attractions for travellers seeking a glimpse of the infamous Northern Lights, visible in this island country from September through April. Viewing the Northern Lights is one of the most beautiful and spectacular experiences for tourists. To view this extravagantly fluorescent natural light show, visitors can drive around the island themselves or join a guided tour of the phenomenon. Either way, a Northern Lights show is one of the best ways to truly experience Iceland and create unforgettable memories. Iceland's leading luxury resort, Hotel Rangá is the only 4-star resort in South Iceland. Located only 2 hours away from Keflavík International Airport. Being located in a rural area there is no issue of light pollution during winter. The unspoiled location surrounding the hotel, and the rustic-chic aesthetic provides guest with a very friendly and unique experience. Unpolluted skies and out of this world star-scape over the River Rangá is what makes Hotel Rangá one of the best destinations to see the Northern Lights. Like any location, there is never any guarantee of seeing the Northern Lights. By staying a few nights, you will have a higher chance of experience this extraordinary natural phenomenon. Hotel Rangá offers assorted services for any travellers wanting to see this event. Staff are on hand to provide a wake-up call to guests so they do not miss out on seeing the phenomenon. Luckily that means you don't have to stay up all night. Guests can watch in comfort in warm clothes and blankets on custom-made benches to experience the beautiful scenery. The hotel offers hot tubs filled with mineral-rich volcanic water where you can view the lights. There is no better way than sitting in the warm water and watching the world's most famous natural wonder. Prices start at A$480 per night, however, this does vary during seasons. Set against a backdrop of mountainous lava fields sits ION Luxury Adventure Hotel. Home to Iceland's best bar to view the twisted green streaks that light up the sky. Less than an hour's drive from Reykjavík, the hotel also offers adventurous treks across glaciers, snorkeling, horseback riding and much more. The floor-to-ceiling glass walls on three sides of the hotel's Northern Lights Bar offers a panoramic view of the elusive Northern Lights and Lake Thingvallavatn. What could be better than sitting back in soft furnishings and having a cold one with your mate and watch the lights? It is even better seen in the outdoor geothermal pool under the hotel. Being surrounded by natural hot springs, it provides the hot water and energy to ION's pool. Prices start at A$494 and are up to A$703 per night. Gullfoss waterfall is one of the most iconic and popular tourist attractions in Iceland, offering an impressive view of the beauty of nature. Known as the best waterfall in Iceland it is also one of the top ten waterfalls in the world. In Icelandic, Gullfoss means Golden Falls due to the water going a golden-brown colour on a sunny day. Perfectly located on the Golden Circle Route in Iceland, it makes it an easy addition to the itinerary. It is also 113km away from Reykjavík, the country's main town. The traversing narrow path provides visitor's close-up views of the massive double staged waterfall. Created at the end of the Ice Age, Gullfoss is a waterfall to remember. No matter what time of year you go the sight is spectacular. During winter the waterfall freezes over into rippling waves of glistening ice. On sunny days’ visitors have a special experience of witnessing dozens of shimmering rainbows over the falls. Dedicate at least 1 hour to walk around and sightsee Gullfoss so you have plenty of time to enjoy the view and take photos. If you want to be the crowds, go early in the day. Situated a few kilometres away from Iceland's southern shore, lies the village Skógar along the Southern Ring Road. Being a popular summer destination travellers see the unusual scenic beauty. The breath-taking Skógafoss waterfall is one of the top summer attractions in Iceland. 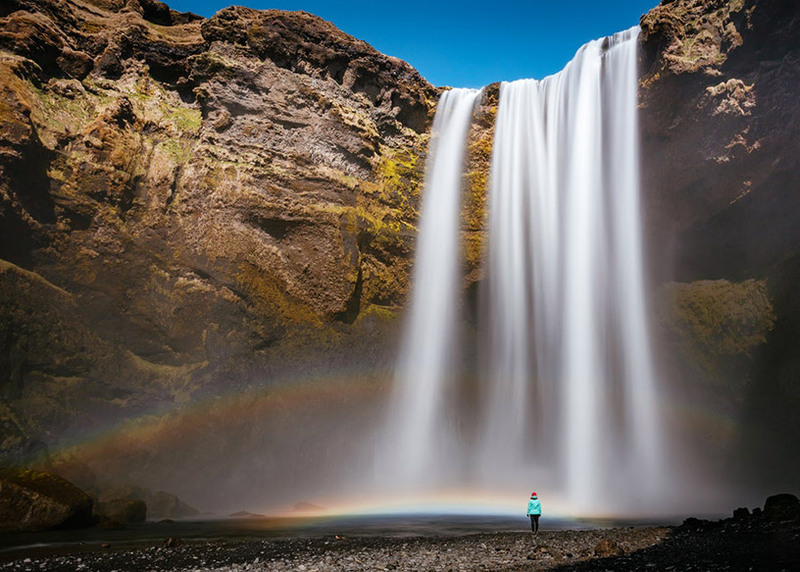 Visitors will constantly be able to experience either a single or double rainbow on sunny days, due to the amount of spray the waterfall produces. Below the falls the river holds a large salmon population. During July – October fisherman can be seen there fishing. The hiking path leading to the top of the waterfall continues the river upstream. There are over 20 smaller waterfalls you can find during the hike. With 527 leading to the observation desk above Skógafoss, it is worth the climb. With nature at your fingertips, you appreciate the beauty and strength of Skógafoss. The lush greenery of the moss and rock formations are what makes this location extraordinary. 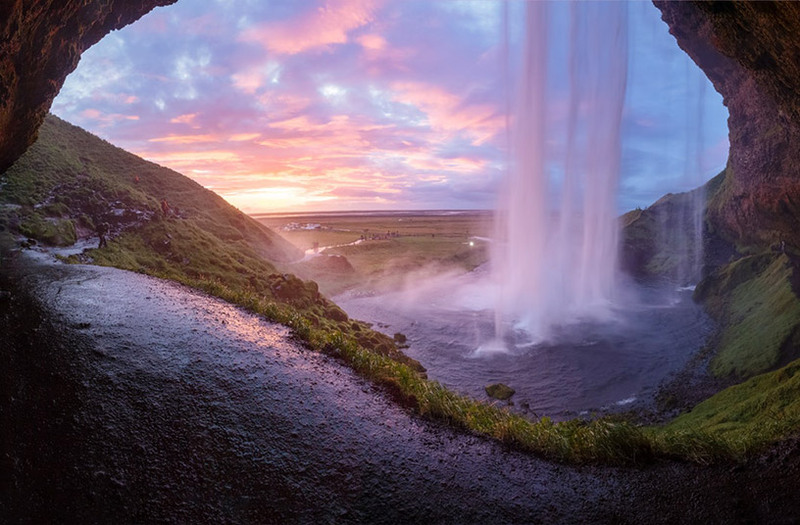 Another widely popular waterfall when travelling is the Seljalandsfoss waterfall. This narrow and tall specimen has a rare distinct feature that other waterfalls don't have. There is a path that leads visitors behind the waterfall, a scene that is hard to find anywhere else in Iceland. With the falls coming down in front of you it is considered one of Iceland's most striking waterfalls. Making it a fundamental visit when travelling the country. If you are lucky to be there on a sunny day being behind the waterfall creates a great moment to view a rainbow. Hot tip: It is usually recommended to have a flash on your camera when taking photos behind Seljalandsfoss, so there are no silhouettes on the waterfall. In winter, the path is usually closed, as it gets extremely slippery behind the waterfall. Walking path behind Seljalandsfoss waterfall at sunset. Image courtesy of Unsplash user Andrey Andreyev. Located just outside Reykjavík lies the dormant Thrihnukagigur volcano, also known as the Three Peaks Crater. The three craters are prominent landmarks, standing against the sky on the highland edge. Unlike any other volcano, guests get to walk inside one of the three magma chambers. The sheer beauty of the crater consists of the various colourations inside the chamber. It can be known to intimidate guests as it is nearly the size of three basketball courts next to each other. With a remarkable height that can fit the full-sized Stature of Liberty. It is one of the top attractions that will take your breath away when you descend into the chamber. Magma chambers are where liquid rock is trying to reach the surface, causing a volcanic eruption. Thrihnukagigur is a rare exception, as the chamber seems to have disappeared. Making it appear that someone pulled a plug and the magma has disappeared. Operating from 15 May – 15 October, provides travellers a small window to see this extraordinary attraction. The tour costs A$513. Don't let this discourage you as this is a destination that will knock your socks off. Guests are typically inside the volcano for 35-40 minutes. At 100 metres deep and 2 kilometres long Fjaðrárgljúfur is a destination in Iceland that gets the recognition it deserves. Situated on the south-eastern side of the country it is known as one of the most beautiful canyons in the world. Being 2.5km off the Southern Ring Road makes it extremely easy to get to. Commonly known as the "Majestic Fjaðrárgljúfur Canyon" its overwhelming beauty is something you want to capture on camera. 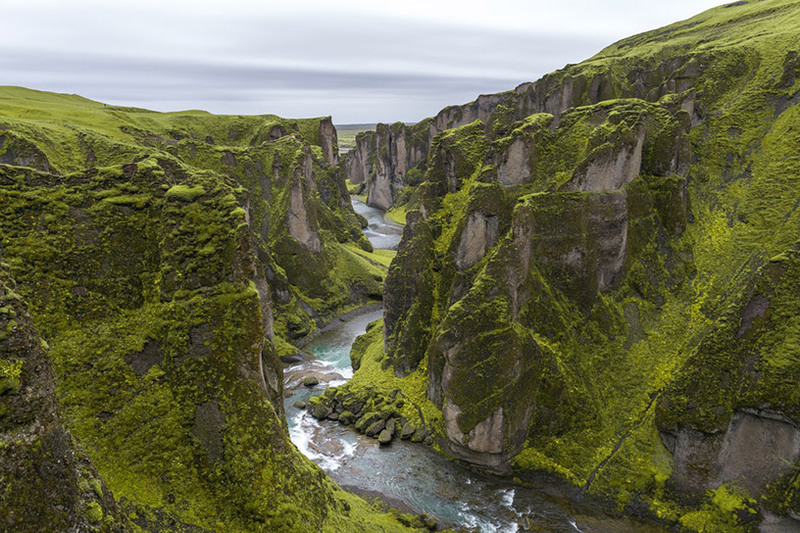 Visitors will experience a peaceful hike up the canyon with outstanding views of the Fjaðrá river. Seeing the changing view and the calming sound of water flowing, you will not be disappointed. Having the best time of year to visit during summer, Fjaðrárgljúfur ranks as one of the best summer attractions in Iceland. It is not recommended to visit during winter, due to the snow causing the hiking trail to be near impossible to get to. Hot tip: Make sure you take with you a comfortable pair of hiking shoes, rain jacket, water and a camera. Known as Iceland's top tourist attraction Blue Lagoon is another vital stop on your tour through Iceland. It is the heart of the countries famous geothermal spas. Located 40 minutes away from Reykjavík this popular destination offers full spa services, in addition to geothermal pools. Being 20 minutes away from the Keflavík International Airport, travellers often find themselves unwinding before their flight back home. Guests spend their visits bathing and relaxing in geothermal seawater, making it no surprise that this is one of Iceland's most sought after tourist attractions—in addition to being one of National Geographic's 25 Wonders of the World. The lagoon water is known for its positive effects on skin and is thought to provide harmony between the body, mind, and spirit. Its constant 39-degree waters will never disappoint. Being situated amongst covered lava fields and dormant volcanoes Blue Lagoon has a stunning sculptured landscape. With its remarkable natural charm and therapeutic allure, the Blue Lagoon is highly regarded as Iceland's top attraction. This is one location that will provide an unforgettable experience. Do not miss out on a chance to soak away the stresses from your busy modern life, and enjoy all the spa treatments Blue Lagoon has to offer. 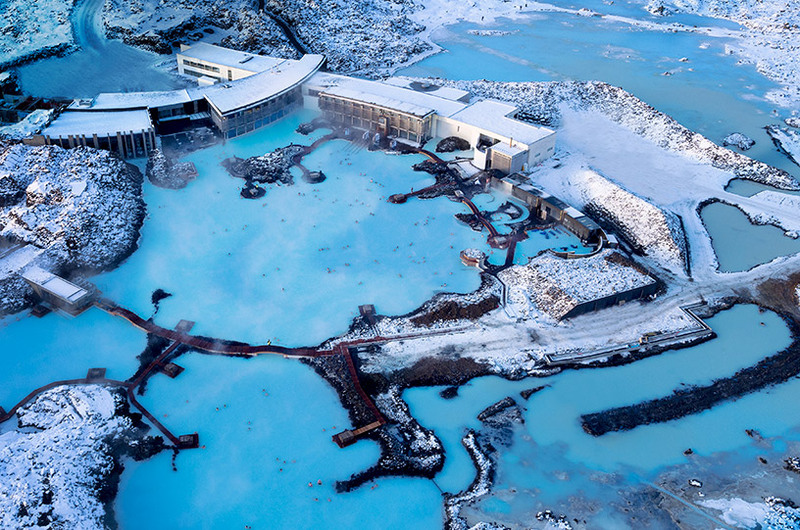 Aerial shot of Blue Lagoon during Winter. Image Courtesy of Blue Lagoon. If you would prefer to visit a quieter and cheaper Lagoon the Secret Lagoon is for you. Known as Iceland's first swimming pool it has been the islands best-kept secret for decades. With the owner keeping it a low profile it was designed for the local community. It is the perfect spot to unwind and enjoy the peacefulness with its 38°c - 40°c water. If you are wanting to beat peak hour visit between 4 pm and 6 pm in summer. Its multiple geothermal spots have miniature Geysers erupting every couple of minutes. This magical location provides a relaxing environment with the steam rising into the air. It's a memorable location to enjoy with a good beer or wine. Secret Lagoon is a known spot during winter that provides a remarkable show of the northern lights. Facilities include showers, a bar and eating area. Don't worry if you forget your towel, you can hire them at the front desk. Do not miss the chance to enjoy the geothermal pool and unwind during your vacation. Grundarfjörður is home to the most magical mountain in Iceland, Kirkjufell. Located 2 hours and 30 minutes from Reykjavík and a short 2 minutes from Grundarfjörður. Kirkjufell is the most photographed and visited mountains in Iceland thanks to its stunning surroundings. Surrounding the mountain are beaches, waterfalls, and lush green grass. Making it a destination that you will remember forever. Its isolated position extending into the ocean is what makes it a top destination for travellers. Visitors can choose from taking a stunning walking trail around the mountain or challenge themselves by climbing to the top. Hiking up the mountain is quite treacherous. It is highly recommended to take a guide with you to ensure your safety. If you are afraid of heights that this might not be the hike for you. Allow between 3-4 hours to make your way up and down the mountain. If you chose to trail around the mountain it can take 3 hours. For any Game of Throne fans, this is an even more special attraction to visit. Kirkjufell was used as one of the filming locations for Game of Thrones season 6 and 7, featured as "arrowhead mountain". This is where Jon Snow and his group venture north of the wall to find the army of the dead. All in all, this is one of Iceland's top attractions that you do not want to miss out on. Head to the sea and see some beautiful sights in Iceland. Iceland's cold waters provide a perfect location for diverse marine life. If you are wanting to go whale watching the best time of year is during their summer. From May to September 8 different species of cetaceans can be frequently seen. Whaling used to be a big part of the island culture in the 1800's and commercial whaling is still practiced in Iceland. Many tourists try in Iceland whale meat since they think this is traditional food. In fact most Icelanders never eat whale meat and Iceland´s booming tourism industry results in an increased whale meat consumption. We recommend to enjoy these wonderful animals in the wild nature on a whale watching tour but not for dinner on your plate. You can also read more about Iceland´s campaign meet us don't eat us. Humpback whale breaching out of the water. Image courtesy of Christina Degener - Iceland Unlimited. Reykjavík has whale watching available all year round. It is the most popular destination due to being the hotspot of the island. If you are staying within this area of Iceland, it is a great place to go whale watching. Most common species that are spotted are minke whales, harbour porpoises, and dolphins. On some occasions tours have spotted the infamous humpback whale. One of the towns best tours is by Reykjavík Sailors, where you have 95% chance of spotting a whale. The standard tour price is $132. If you have small children or you get seasick easily this is one tour group that is ideal. Akureyri is a perfect location as the sea is sheltered from strong wind and high waves due to the mountainous terrain. 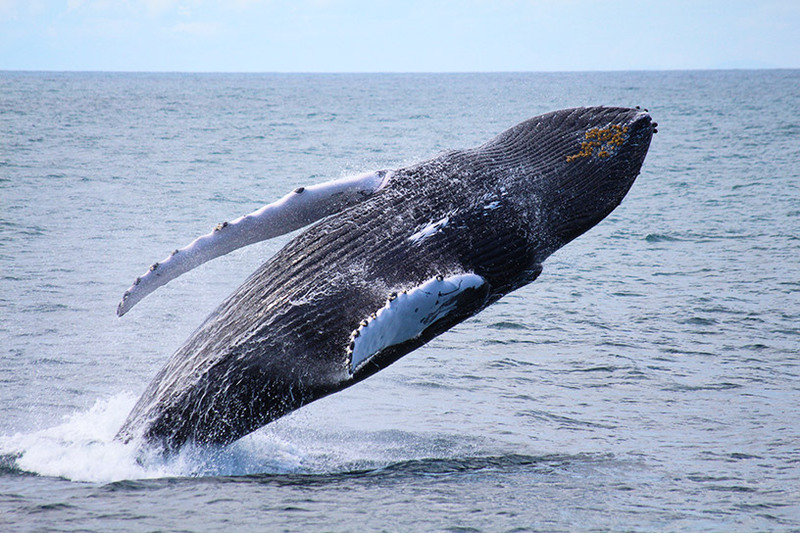 The best part of the whale watching tours in this town is the primary species you see is the humpback whale. You can still see minke, white-beaked dolphins, and harbour porpoise. One of the most popular whale watching tour groups in Akureyri is Ambassador Whale Watching. Prices for their normal tour start at A$139, or if you are interested in an extreme whale watching experience prices start at A$244. Globally recognised as one of the best whale watching locations in Europe. If you are unsure where to go whale watching, you will not be dissatisfied at Húsavík. Tours are offered from May to November. Species in this location include blue whales, humpbacks, minke whales, and dolphins. Being a lover of the majestic humpback you will not be disappointed on the Húsavík whale watching trip in Skjalfandi Bay. This mesmerising location is perfect if you are wanting to get away from the hustle and bustle of Reykjavík. However, if you are a lover of wildlife and enthralled with Iceland's wildlife, definitely take the sailing tour of Húsavík. Where you will be able to see both whales and puffins. North Sailing Húsavík Whale Watching is a great tour group where they offer a unique experience of using traditional oak ships. Prices start at A$120. Another great whale watching location in Snaefellsnes peninsula. This is one of the best places in Iceland to see Orcas. The best time of year is during winter and early summer. If you are a lover of orcas and find them interesting, then this is a great spot to visit. Travellers will still get to see other impressive wildlife in this location such as grey seals and white-tailed eagles. During summer time you can still see minke whales, humpbacks, white-beaked dolphins and harbour porpoises. This magical location will inspire you to explore around the peninsula as it has some beautiful attractions such as waterfalls, lava fields, and glaciers. Iceland Unlimited is a highly recognised travel service in Iceland that have offer great whale watching experience in Snaefellsnes peninsula. Their prices start at A$121. In a country of innumerable natural wonders and stunning vistas, Reynisfjara stands out as one of Iceland's must-see attractions. The black pebble beach along Iceland's south coast—not far from the charming town Vík í Mýrdal—tells the story of two powerful forces that have worked together over a millennium to shape this inhabited rock in the North Atlantic. At Reynisfjara, visitors can bear witness to the creation and destruction of the island by way of the stunning pyramid of basalt columns and dramatic rocky coastline formed by volcanic eruptions, and the relentless seas that persist in eroding them away. What results is a powerfully dramatic and stunningly beautiful location, that includes the beach and basalt columns. As well as the towering Dyrhólaey cliff and Reynisdrangar stacks, marking where the shoreline once extended before losing its battle against the pounding waves. 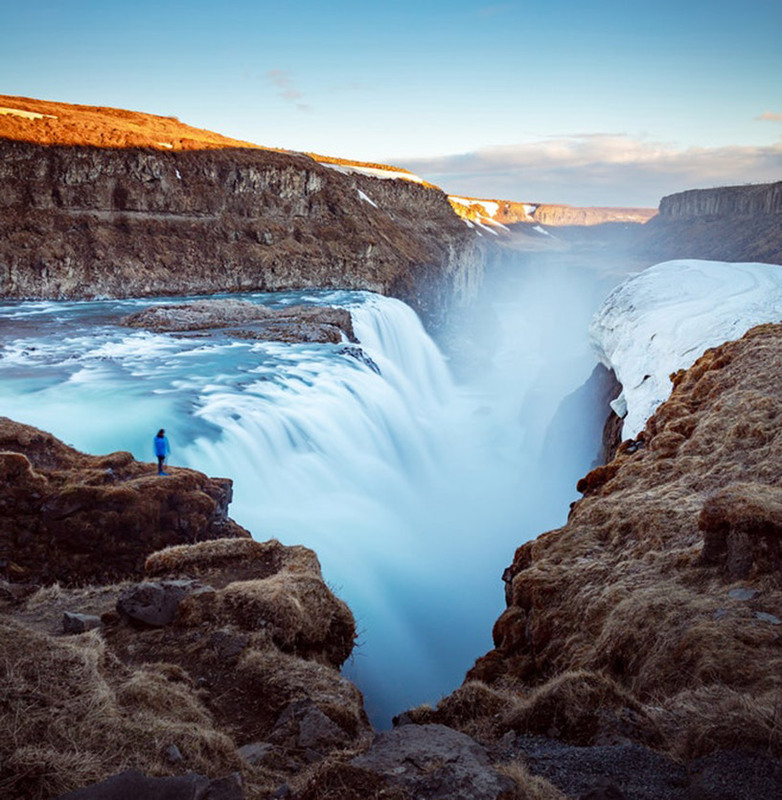 If you are thinking of doing a tour, Nordic Visitor is one of Iceland's leading travel experts who have numerous tours which take you to Reynisfjara and more of Iceland's best attractions such as Gullfoss and the Blue Lagoon. Hot tip: A strong word of caution, not only is this beach one of the most beautiful places in Iceland, it is also one of the most dangerous. Strong sneaker waves are commonplace, even on otherwise calm days, and have been fatal. Visitors should stay far back from the waterline at all times. 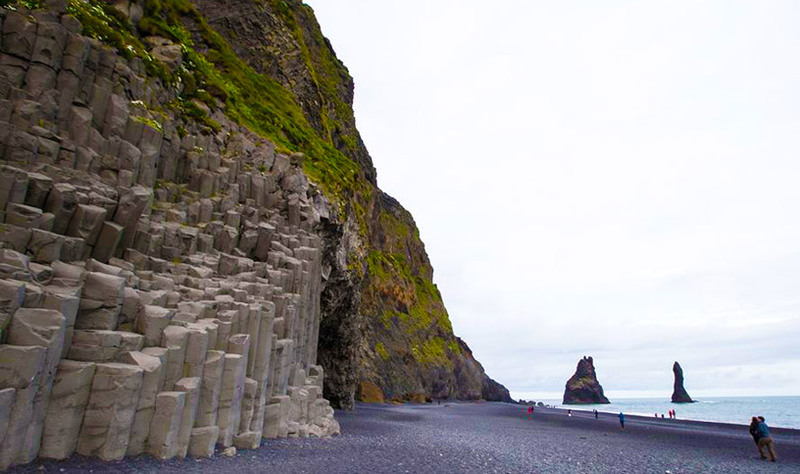 Reynisfjara's infamous black pebbled beach and basalt columns. Image courtesy of Nordic Visitor.